It’s a happy time of year in Moscow: everyone’s stuck in huge traffic jams caused by snow and officials’ lousy road planning abilities. But the holiday spirit is here, everything is sold, everything is bought. Our mailboxes are full of spam messages of every sort. Sometimes it feels like we are living in the country of the richest people in the world. The only problem is we are not. The simple fact that we are overpaying for every product we buy doesn’t make us richer – or smarter. Still, they say more than 40% of all alcohol sold in Russia is sold during this hot pre-New Year season. Russians’ drinking habits did change during the last decade. In the 90-th you could easily catch some new-born oligarch taking a Petrus bath – baptizing of a kind; today it’s a destiny of a regional mafia leader trying to impress his Moscow “mates” with expensive stuff. And still, these folks will bargain for each 10K rubles (300 USD) of the Petrus bottle price (which is around 6000 USD for a bottle of 1992 vintage). On the other hand, I sometimes ask myself – if Gazprom bosses are still using Petrus as their table wine, how much have we really changed? 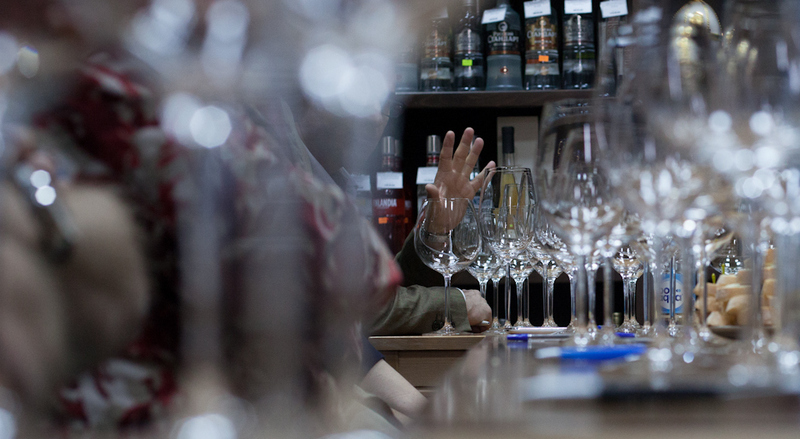 True, Russia (and Moscow precisely) has bred several thousand West-looking ambitious professionals who believe wine culture is worth diving into. They are top and middle managers and CEOs of big multinational companies, sometimes Russian companies too. During one of the tastings with the top multinational law firm based just in front of Kremlin they shared a small insight of why they needed these tastings: “We are stuck in our offices for 12 hours a day, we are office inhabitants. We need this to know that there’s life outside the walls of our company”. The shift towards fine wines is driven by people who travel a lot, mostly work in international environment, who has the brains to reach out for more. While vodka sales continue to play the major part and dominating the market in general, wine sales are booming at a much smaller scale – inspired not only by wine importers but also by all kinds of cooking schools and classes. For it’s true that not less than drinking Russians like eating. Even the spirits producers are turning more and more to the food-spirits pairings. Cooking master-classes are very fashionable in Moscow – you will find famous journalists and celebrities cooking on the TV or in the self-made and branded cooking schools of top Moscow restaurants. It is fashionable to be in good shape and eat healthy – especially among business ladies and housewives, but also among young professionals who want to speed up the process of learning that magic l’arte de vivre. Growing restaurant and bar culture also adds to that spirit of joy. While the number of them is relatively small in comparison to other big cities of the world, the scene is ever-changing and offering every kind of experience to a Russian bon vivant. Some trendy places are almost out of time, like Café Pushkine, others just come and go. The trend of 2012 is the number of newly-opening wine bars which attract us with wide wine-by-the-glass selection. Wine pricing is usually the Achilles’ heel of any Russian restaurant – only people with quite a high income can afford to drink a bottle on-premise. While taking a bottle to the venue with you (BYOB) could be a reasonable step, Russian restaurants normally won’t support this “bold” idea and the corkage fee is virtually unknown. Still, this won’t prevent our citizen to visit top Argentine restaurant El Gaucho and easily leave 300 USD during the evening. Good news, I didn’t see any table with no wine on it. Of course, drinking at home will remain the best way to spend your time here. Long kitchen talks – this is what a Russian is all about. We like kitchens and being there. It’s usually small and cozy, plus the food is near. I’d be happy to say one day that most Russians choose Champagne as their New Year celebration drink, but we have to cope with the reality – in most cases ordinary Russians aim to something more affordable – a bottle of so-called Soviet Champagne (cheap Russian sparkling) or cheap sweet Italian Asti with a nice shining label on it. The number of consumers celebrating with a bottle of Cristal is desperately small in comparison to them. But isn’t it true everywhere in the world? The good thing about Champagne consumption here is the growth – Russia is bound to become one of the fastest growing markets for the Champagne category. Cheers and Na zdorovie!